Works: prabhandhams: sri dhEvarAja mangaLam, yathirAja vimsathi, upadhEsa rathina mAlai, thiruvAimozhi nURRanthAdhi, Arthi prabhandham. vyAkyAnams for: mumukshupadi, thathva thrayam, srivachana bhUshaNam, AchArya hrudhayam, periyAzhwAr thirumozhi (for the portion which was missing from periyavAchAn piLLai’s vyAkyAnam), rAmAnusa nURRanthAdhi. pramANa thirattu (compilation of all slOkams, sAsthra vAkhyams in a particular gratham) for: eedu 36000 padi, jnAna sAram, pramEya sAram, thathva thrayam, srivachana bhUshaNam. Again mAmunigaL goes on a yAthrai to thirumalai. On the way, he performs mangaLAsAsanam to kachi pEraruLALan and stays in kAnchipuram for some time to reform many srivaishnavas there. He instructs appAchiAraNNA to stay in kAnchipuram as his representative. He then proceeds to thirumalai via thirukadigai, eRumbi, thirupputkuzhi, etc and reaches thirumalai. 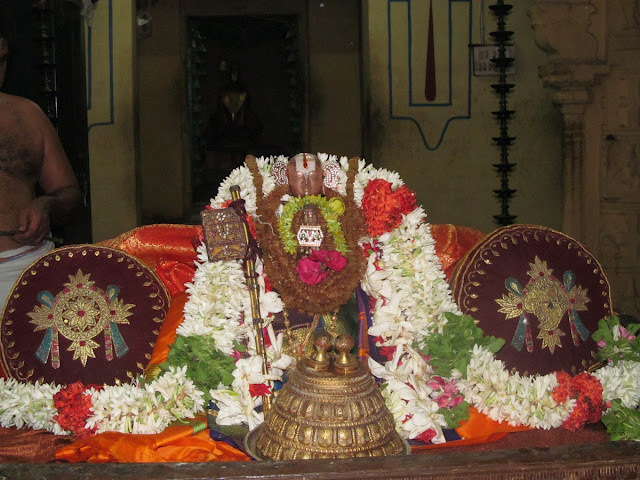 After performing mangaLAsAsanam there, he appoints a siriya kELvi appan jIyar to help periya kELvi appan jIyar (who was appointed by emperumAnAr himself) in his kainkaryams. On his way back he performs mangaLAsAsanam to thiruevvuL vijaya rAghavan, thiruvallikkENi vEnkata krishnan and many other dhivyadhEsams. He arrives at madhurAnthagam and worships the place where periya nambi performed pancha samskAram to rAmAnujar. He then reaches thiruvAli thirunagari and enjoys thirumangai AzhwArs and submits of vadivazhagu pAsuram and performs mangaLAsAsanam to all the emperumAns in the region. He then reaches thirukkaNNapuram, enjoys the sarvAnga sundhara (sourirAja) emperumAn and establishes a thirumEni for thirumangai AzhwAr there. After visiting many other dhivya dhEsams he finally returns to srirangam and stays there. mAmunigaL goes on a pAndiya nAttu dhivya dhEsa yAthrai once again. On his way, the king of that region becomes his sishya and performs many dhivya dhEsa kainkaryams based on his orders. mAmunigaL is the only AchAryan from our pUrvAchAryas whose thiruvadhyayanam is celebrated. Usually thiruvadhyayanam is celebrated by sishyas and sons. In this case, sri ranganAthan is the living sishya of mAmunigaL who celebrates his AchAryan’s thIrtham in a grand manner even today. He sends his own archakas, parichArakas, paraphernelia (all his vattil, kudai, chAnaram, etc), etc for the mahOthsavam. For detailed information in this mahOthsavam please view http://www.kArimAran.com/thiruadhyayanam.html. His life was an example for the writings of our pUrvAchAryas on how a srivaishnava should conduct himselves. This was discussed in detail in adiyen’s ebook named srivaishnava lakshaNam. Click here to see this series of articles and ebook – http://ponnadi.blogspot.in/p/srivaishnava-lakshanam.html.